What’s So Cool About This Edamame? 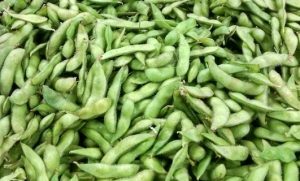 Edamame – or soybeans that have been harvested fresh, before the beans harden – makes a great snack. Edamame is also a good source of iron, calcium, and protein, especially for vegetarians. 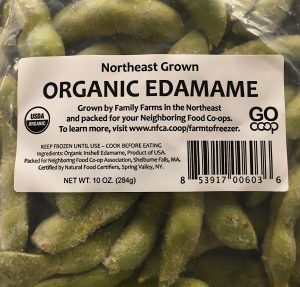 There are a lot more good things to say about edamame — but one thing that makes our Northeast Grown frozen, organic edamame is that it is grown, harvested and processed right here in our region, and is available only at your Neighboring Food Co-ops. And when you choose organic, you are keeping chemical pesticides, synthetic fertilizers, and genetically modified organisms out of our food system and environment. Our frozen edamame makes a simple, healthy snack for you and your family. This recipe is designed to be quick and easy, designed around one 10 oz package of frozen Broccoli and ready to eat in 30 minutes. Sprinkle a pinch of salt in 5 cups of water and bring to a boil. Pour one 10 oz bag of edamame in the water. Boil until tender (about 5 minutes). Enjoy by squeezing edamame out of pods with your teeth. Want to make it more interesting? Try spicing it up! Heat 1 tsp olive oil or sesame oil in a small skillet. Stir in one large, chopped garlic clove. Stir over medium heat for 1 minute or so. Transfer cooked edamame to a large bowl. Pour oil, garlic and spices over edamame and stir to cover completely. Squeeze lime wedge over edamame. Serve garnished with remain scallions.